These four letters were written by Joseph Augustus Hodsdon (1841-1863), a private in Company A of 17th Maine (“Red Diamond”) Regiment. 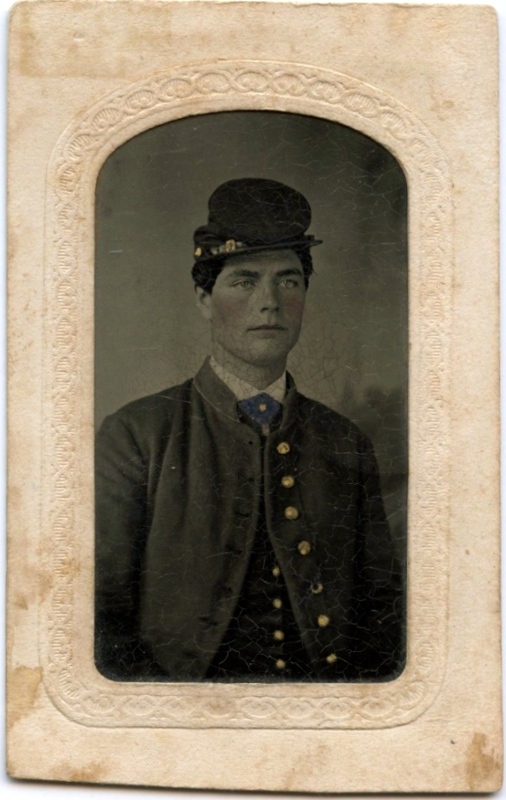 He enlisted on 18 August 1862 and was killed in Rose’s wheatfield just north of the Devil’s Den on the evening of 2 July 1863 during the three-day Battle of Gettysburg. The 17th Maine was in de Trobriand’s Brigade, in Birney’s Red Diamond Division, of Sickles’ Corps at Gettysburg. They paid the price for Sickles’ poor judgement in pushing his line out onto the Emmitsburg Road ridge where their flanks were exposed. The regiment lost 18 killed or mortally wounded, 112 wounded, and 3 missing during the engagement in the Wheatfield. Pvt. Hodsdon was the son of Ezekiel Hinckley Hodsdon (1817-1897) and Elizabeth Esther Prince (1819-1879) from Falmouth, Cumberland County, Maine. Other Hodsdon family children included Hannah Elizabeth Hodsdon (b. 1843), Celia Emeline Hodsdon (1845-1850), William Prince Hodsdon (1850-1854), James Davis Hodsdon (1853-1854), Annie Eileen Hodsdon (b. 1855), and Wallace (“Wallie”) Prince Hodsdon (b. 1861). 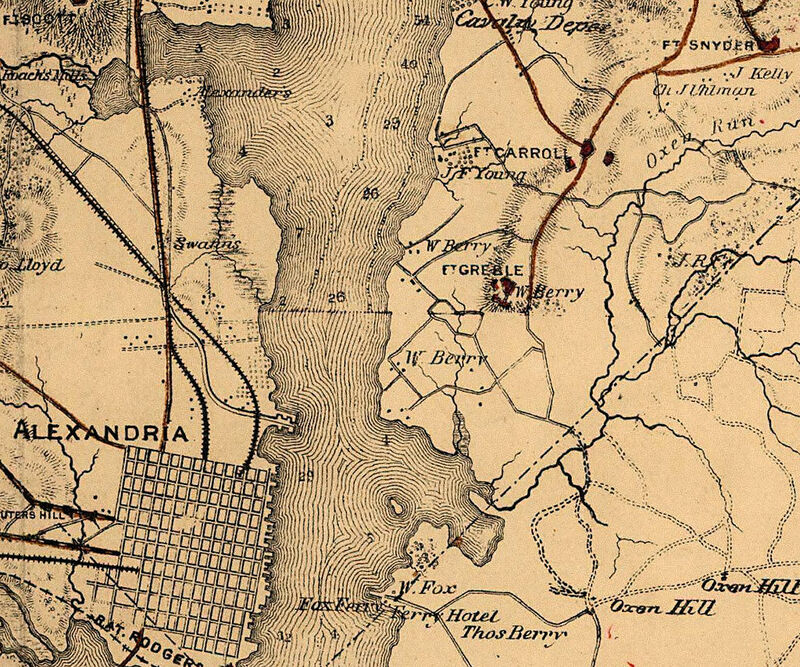 This map shows the location of Fort Greble near the conjunction of the Anacostia and Potomac Rivers as well as its proximity to the city of Alexandria, Virginia. After four days travel we arrived to our place of destination and we were glad enough too for we traveled night and day for three days and three nights. We had a nice supper in Philadelphia which was the first time we made any stop hardly at all. We stopped about four hours, then marched through the city to the cars. They they piled us into cattle cars as thick as three in a bed. While we were passing through the city, it was a shake of the hand and goodbye, both by men and women, old and young, but there — I cannot stop to give all the details for I have not time and perhaps it would not be of much interest to you. We are in sight of the Capitol on the southern side about eight miles and on the south of us lays troops all around on the other side of the Potomac which is some six or eight miles from here. Our boys are all well, I believe. Our company has the best Fort on the line. We all went down to the river and had a good wash, you may bet on that. It is very pleasant here. I hope you are all well at home. Have you rode any of late? Tell George I want him to write to me if he will . You can give him the directions and also tell any of my friends that I should be glad to hear from them at any time if they would take the trouble to write. And if it is so that I can, I will return an answer to them. Do not let anyone see this for it would scare them. I don’t know as you can find this out but hope you will excuse me for we have not got the best of chances to write and my paper was all covered with dust and dirt besides being all wrinkled up. I shall not have time to write much more but will again soon as I can. I want you to write as soon as you get this and let me know how you all are. tell mother I want her to write too and I don’t care how many more of you write either. I send a kiss to you all and love to every enquiring friends. Write soon and direct to Washington D. C., Co. A, 17th Me. Regt. Camp Curtin near Potomac Creek, Va. I now take my pen to write you a few lines for we expect to move tomorrow morning across the river. We have had orders to have eight days rations dealt out to us and for every man to have one shirt and pair of drawers and socks. Our cavalry have crossed the river and if they are successful, we shall have to go. I am glad that I have got well so as to go with them for I want to do my part. I don’t know when I shall have another chance to write you so thought I must write a few lines today. It may be that I shall never have another chance but we will hope for the best and put over. Trust in God and say His will be done and pray to Him that if we are not permitted to meet again here on earth, that we may meet in Heaven where there will be no more parting and no more wars but where all is peace and happiness. I hope God will give me strength and courage and preserve me from danger but if I fall, I shall do so trying to do my duty and in a good cause. We know that many must fall but if we are but prepared to die, we shall have no fears about it or in what manner we die, if we love God and try to serve Him and ask Him to forgive us our sins and make us pure with the blood of the Lamb, He surely will do it. We are to go in as light marching order as possible. We are to carry our overcoat and rubber blankets and a tent piece and leave our woolen ones behind. This may jar your feelings some but I know that you have a patriot’s heart such as everyone should have and when I think of the loved ones at home, I feel that I have something to fight for and dear sister, rest assured I shall do all I can to maintain our rights and preserve our free institutions. But I shall have to bring my letter to a close soon for I have got my knapsack to pack for inspection and draw my rations, get things ready in general. Camp Sickles near Potomac Creek, Va. I now sit down to write you a few lines as I have nothing else to do today but write or anything that I am a mind to. It was my turn to go on guard today so I got ready and went over to guard mounting and after the guard had been inspected, the order was to excuse the best looking man and have it go for his duty and as good luck would have it, it fell to me. I have been looking for a letter from you for some time. Have received none since the battle. ¹ I hope you are not sick or anything of the kind. I understand that the conference is to be held in our place in June. I wish I was going to be there to attend it with you. Josie Hobbs is going home on a furlough I suppose soon. I am glad of it for he is lame and can do no duty so he might just as well go as not. How is Emma and Carrie Gene? Should [like] to see them much, and how do you like your school? I wish you could attend all summer but I suppose it would be too much for you. Besides, mother will want you to help her. You must ride all you can this summer for it will be a benefit to your health. But be careful when you are riding with any of the girls and not ride too fast at first for Old Tige is sometimes rather headstrong. I suppose father has as much pairing as he can do. I hear that business is very good in that line and wages very high. Well I am getting pretty good — thirteen dollars a month and a plenty of hard tack and pork. But never mind, it won’t always be so, I hope. I am well and fat as a pig and did we not drill everyday, I should get so lazy I could not move. I suppose the nine months men will go home soon. Well joy go with them. We will all go home in a few years if not in a few months. How is dear little Wallie getting along this summer? I hope he is so he can go outdoors and play with Nellie. I believe I will not write much more now for it is getting near dinner time and I can think of nothing more worth mentioning. Give my love to all inquiring friends and to father, mother, Nellie, and Wallie, and keep a good share for yourself. Write soon as you can. From your loving brother, — Joseph A. Hodsdon, Co. A, 17th Maine Regt. ¹ Joseph is referring to the Battle of Chancellorsville (1-5 May 1863) in which the 17th Maine Infantry suffered 116 casualties. I now seat myself to answer your letter of the 4th which I received tonight. I was very glad to hear from you. It seems a long time for me not to hear from someone of you oftener than once a week but I suppose you are so busy that you don’t have time to write. I am well and hope you are the same. Am sorry to hear that father is so afflicted but hope he get well soon for I know he is in a hurry to get his barn done and the rest of his work. You asked me why Joel did not write you. I think it because he has not had a chance as they have been on the move now for the past two or three weeks. When I was over to see him, he said he was owing you a letter and that he was going to write you in a few days if he could get the time. I should like to hear my dear little brother sing and my sister too but I don’t think I could do much towards it myself as I hardly ever attempt anything of the kind nowadays. Josie Hobbs is at home now on a furlough. I should like to be with you a spell to have a ride on horseback. I should enjoy it more than ever. You must be very careful when you are riding and keep your reins up snug and then you can handle your horse as you are a mind to. I think that little verse you sent very pretty. Did you compose it? We are under marching orders yet. I expect everyday we shall get orders to leave this place but I don’t much care for we shall get rid of drilling then — not that drilling is very hard but to me, but there is such a growling about it in the company. But I must stop here for it is getting late and I have made crooked lines enough. Give my love to all and write soon as you can. A good night to you all and a kiss for all from your affectionate brother, — J. A. H.
P. S. Tell father I should like to have him get me a sheet of the finest sand cloth to polish my gun with and put it in a newspaper and send me. I can get a plenty of sandpaper here but no sand cloth. I guess I will send the receipt in my next letter. Yours, — Joseph A. H.
This entry was posted on Monday, October 27th, 2014 at 11:39 pm	and posted in Uncategorized. You can follow any responses to this entry through the RSS 2.0 feed.